The history of the Thornbury Football Club was described in one the publications written by Wallace Phillips. It was included in Wallace’s book ‘Thornbury (Pages from the Past)’ printed by F. Bailey & Son, 1977. Copies are this book are held by Thornbury Library. Please use the links at the side of the page to read other articles by Wallace Phillips. “While the exact date of the formation of a football club in Thornbury is uncertain it is known that football was being played in Thornbury in 1896 and that there was a Thornbury Town Club in 1898. At first they played friendly matches but in a short time the club joined the Dursley & Wotton League. In this their great rivals whom they were seldom able to beat were Wickwar. The first team (which very old stagers say was the best) was – goalkeeper Frank (Ranjie) Williams; backs Bob Burchell and Horace Cooper; half backs George Phillips, H. Trayhurn, E. Collins, A. Penduck; forwards – Oliver Stiddard, considered the best centre forward Thornbury ever had, who was a butler to the Maclaine family, millionaire owners of estates in the district who lived at Kington, S. Thomas, Fred Sainsbury, H. Smith, H. Phillips, E. Cartwright and A. C. Pitcher. On December 9, 1899 Thornbury A.F.C. played a friendly match against Westbury Park the team being Frank Williams; 0. Quin, a solicitor, Ernest Pitcher; J. Huish, A. Selby, A. Burchell; W. Eddington, A. Thomas, H. Smith, D. Watson and Fred Sainsbury. The following week Thornbury had a friendly against Chipping Sodbury. The transport for away matches was a two-horse-drawn brake owned by Mr. W. Pegg of the Swan and driven by a Mr. Bayliss. On at least one early Sunday morning the team was found pushing the brake to assist the horses up Charfield Hill on their way back from a match they had won at Wotton-under-Edge. The first ground was Daggs, opposite the Cedars. From there the club moved to the Castle near the Castle cricket ground; from there to near the Gas House, now Park Road. While there a Thursday XI was formed for shop-keepers. Their captain was a Mr. Alsop. The next field was behind Brownings (now the antique clock shop) in High Street and then came the start of the 1914-18 war when football ended for the time being. During this time other players and officers joined the club including such fine players as Claude Higgins, Nelson Higgins, Dr. E. M. Grace, (later to become the club’s president for many years) and his brother Francis Grace, L. Collins, S. Collins, R. Champion and A. Symes. 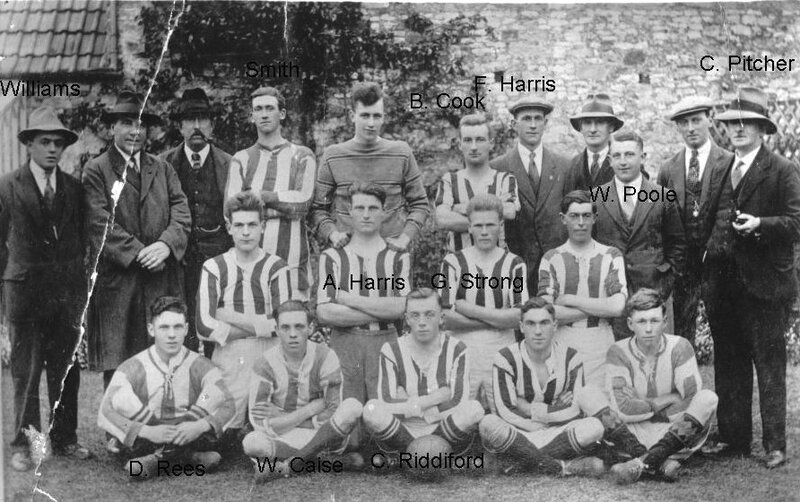 After the 1914-18 War the Club was re-formed and played at the start in the 1st Division of the Bristol and Suburban League. The officers were A. C. Pitcher, J. W. Thompson, A. G. Excell, A. Prewett. The ground was a fine one enclosed by an iron fence – Blakes – which was later the top part of the Thornbury Grammar School playing field. This was provided by Edmund Cullimore at a charge of £40 a year. The dressing rooms and headquarters were at the old Social Club in High Street where the Midland Bank now stands. The team at that time included J. Oates, A. Symes, H. Thompson, N. Higgins, L. Collins, S. Collins, A. Prewett, A. Wills, P. Dyer, H. Walker, A. Walker, R. Tucker, F. Biddle, H. Ellis. With players joining fast, football began to spread. In 1923 a new league in Bristol was formed, the Wesleyan Er Free Church League, also a Thornbury & District League. This was about the time when football had it greatest appeal. There was a club in every small village in the district. The Wesleyan Chapel formed a club under Pastor F. Fellows. It joined the Wesleyan & Free Church League and played on The Chantry field, later the Grammar School sports field in Church Road. The players divided, also many officials. Henry Thompson was captain of the Wesleyan team while his brothers Dennis and Jack became leaders of the Town Club. Reg Champion became secretary of the Thornbury & District League, and A. Symes and F. Biddle became referees. Frank Biddle was a referee for 25 years becoming a Class I referee. This lasted for about six years during which many very good players joined one or other of the two clubs. Quite a few representative matches were played in Thornbury. One of the best was the Wesleyan & Free Church League v. Plymouth League on the Chantry field in the 1928-29 season. In June, 1930 Arthur Lewis was chairman and Jack Thompson hon. secretary of the Thornbury Town Club and it is recorded that the 1st XI were runners up in Division II of the Bristol and District League while the Reserves whose team had only been started the previous year were runners up in Division 5 of the Bristol & District League. In about 1933 the two clubs amalgamated to form one club under the name of Thornbury Sports. This is the club which is now running, although it later dropped the ‘Sports’ to become Thornbury A.F.C. reverting officially a couple of seasons ago to Thornbury Town A.F.C. For a couple of seasons Thornbury Sports played on the Chantry field, from there they went to Daggs, again for a couple of seasons, and then to Trayhurn’s field in Gloucester Road, which is now covered with houses, and North Road. This was generally considered the best field the club ever had and, indeed, it was considered by many to be the best field in the Bristol District. In 1934 with the help of the Thornbury Traders and Mr. R. Leakey, a local representative XI was selected to play Bristol Rovers one year and Bristol City the next. This in time led to the gift of a silver cup for the winners known as the Berkeley Hunt District Cup competition. All the gate takings were given to local hospitals. At the end of each season one of the professional clubs played a selected XI from the competition. Henry Thompson was chairman and Frank Biddle the hon. secretary. The last match to be played in Thornbury before the outbreak of the 1939-45 war was Bristol City v. the Selected Xl. The gate proceeds were about £20. In the late 1930s the Club, then playing in Division Ill of the Bristol & District League reached the final of the G.F.A. Junior Cup without gaining the trophy. Thornbury’s goalkeeper on that occasion was Robert Mayo, later to become a Chief Superintendent of Police. During the war football was kept very much alive in Thornbury by the Maritime Regt. R.A. whose headquarters were in the town from 1940-46. Most of the matches were Service games and they won the Services Cup on the Bristol City ground in 1943. Included in their team were some great players including Evans of Cardiff and Wales, Hunt of Manchester United, Dawson of Coventry City, Swan of Leicester City, McKenna of Aberdeen and Bedford of Bristol City. At the end of the war with the help of the Maritime Regiment the Thornbury Club was re-formed and started playing in the Mundy Playing Field. The officers were chairman – Henry Thompson, hon. Secretary – Ted Thurston, hon. Treasurer – Wallace Phillips and most of the pre-war committee with the exception of those who gave their lives in the War. These included a fine one-time secretary, Mervyn Burns, with whose death all the minute books were lost. When the Club restarted in 1945 it had less than thirty shillings in the bank. New players who joined and helped to raise the standard of the club included Harry Johnson of Thornbury Grammar School and Les Byram, captain for some seasons. In spite of disappointments with dressing rooms – these included primitive arrangements in premises at the back of the Exchange, at Porch House and even at The Market – the Club has grown in strength thanks to loyal players and officials who have served the club and town well. With the erection of the Pavilion on the Mundy Playing Fields by the Parish Council which were opened on May 1st, 1964, the difficulties of dressing room accommodation were finally overcome. 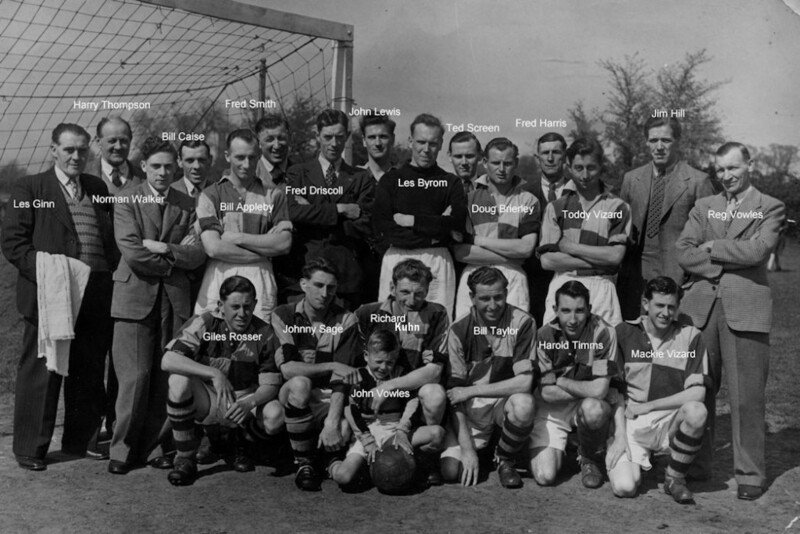 In the seasons after the war the club struggled on, sometimes with one team, sometimes with two until in 1949-50 Thornbury won the championship of Division III of the Bristol and District League and the following season gained promotion to Division I after being runners up in Division II. With the formation of the Bristol Premier Combination, Thornbury were elected to the 1st Division. In 1951-52 the Club reached the semi-final of the GFA Senior Amateur Cup only to lose to Horfield Old Boys. In 1956-57 the Club reached its high-water mark by winning the championship of the Premier Combination under the captaincy of Cyril Lambert. This feat was celebrated at a dinner held in the Cossham Hall in October, 1957 at which the guest of honour was Sir Stanley Rous, then Secretary of the Football Association and later President of F.I.F.A., whose presence in Thornbury was due to the efforts of his friend, Mr. S. J. V. Rouch, Head of Thornbury Grammar School and a Club Vice-President. Sir Stanley distributed the medals to the team and made presentations on behalf of the Supporters Club to Henry Thompson, chairman and Wallace Phillips, hon. treasurer. The following season the Club reached the semi-final of the G.F.A. Senior Amateur Cup only to go down to Pucklechurch. Another important landmark in the history of the club arrived in 1968-69 when Thornbury Club severed its connections with the Bristol & District Combination and League which had existed for nearly half a century to become one of the founder members of the Gloucestershire County League. This was a league formed from the leading clubs from the north and south of Gloucestershire and Bristol and the Thornbury Club representatives in the negotiations leading to its formation were Bill Whittaker, club captain who later succeeded John Bell as chairman, and Roy Wood, hon. secretary. Thornbury’s 1st XI have remained in the County League ever since, having their ups and downs. Most seasons the team has been in the middle or upper half of the League but on one occasion had to seek re-election. In the seasons 1975-76 and 1974-75 the Club reached the semi-finals of the GFA Senior Amateur Cup. The Reserves who joined the Stroud League at the same time as the County League began won the championship of Division Ill in their first season and the championship of Division II in the following season. On looking back over the history of football in Thornbury one is struck by the way in which families have played such a large part in the game and the long and outstanding service of certain individuals. The Walker family had a very long association with the Club – Arthur and Herbert Walker as players and later supporters, Norman Walker as a player and an hon. secretary for some eleven years, Brian, David and Godfrey Walker as players. Arthur Lewis, one time chairman and vice-chairman, later to become a Life Member and his sons, Howard and John, outstanding players and captains; Frank Biddle, player, later hon. secretary who joined the club in 1920 and resigned in 1950 on being made a vice-chairman of the District League after having represented Thornbury on the League Committee from 1928. He remains a Vice-President of the Thornbury Club and has been vice-chairman of the Premier Combination, vice-chairman of the Bristol & District League and a member of the Gloucestershire F.A. Council for many years. His son, Don Biddle was also a player and hon. secretary of the Town Club and has since become a referee, now regarded as one of the leading English League referees. George Phillips had an association with the club extending over sixty years and his brother Harry was at one time a player. A cousin, Wallace Phillips joined the club committee on the amalgamation in 1933 and when the club restarted in 1945 he was appointed hon. treasurer, an office he held for over 23 years. Shortly after, he succeeded Dr. E. M. Grace as president, an office he held for some five years until retiring in 1976. Dr. E. M. Grace who had played for the club before 1914 was for a number of years the club president and his predecessors in that office had included Mr. Dutson and Capt. W. Bruce, R.N. Ret. Others who have given more than 25 years service to the club have included Fred Harris, Ted Thurston and A. C. Pitcher. Another family with close connections with Thornbury Football Club was that of Jock Hamilton who with his sons David (‘Chick’) and Ian all played at different periods for Bristol Rovers League side while another son Roger played a number of seasons for the town. David, who, with his family met a tragic death in a fire at their home, is commemorated by a silver cup, known as ‘The Chick Hamilton Cup’ given by his parents and family in his memory. This is awarded annually to the Thornbury Club player who most closely follows the pattern of sportsmanship on the field of play set by David. The first winner of this trophy in 1962 was Ray Shergold, another player who gave outstanding service to the Club. For a number of years Bristol Rovers played an end-of-season game against Thornbury in memory of David, the proceeds going for some charity. The Club has always endeavoured to live up to the spirit of the motto printed for many years on its fixture cards. Since the early 1960s the Thornbury Youth Club with Cyril Lambert, the former Town captain and goalkeeper, as their inspiration and drivingforce, have been providing football independently for the local Thornbury youth. In that period the first 16-year-old youth side has expanded until there are now two Senior sides, the 1st XI doing very well in the Senior Division of the Bristol & Suburban League and the 2nd XI in the 3rd Division of the Suburban League and in addition there are no fewer than three junior sides at different age levels. At the time of writing serious consideration is being given to the creation of another side to fill the 16-18 year-old age gap. When the 16-year-old side first started Cyril Lambert used to pile the eleven youngsters into his estate car and take them to their away matches all over the Severn Vale. The teams have steadily improved and from about 1965 one or other side has won a cup or trophy each season. Starting in the second division of the Regional Youth League in 1965-66 the Thornbury Youth 15-16 side won promotion into the first division and then were runners-up twice and winners once of the first division. They joined the third division of the Bristol Suburban League which they won in their first season. In their first season in the second division they gained promotion to the Senior Division and have since been doing very well in this higher competition. This season (1976-77) the young reserve team is doing well in the Stroud League and last season two junior teams were entered in the North West Avon 14 and 15 year area levels. An Under 15 side plays in the Bath & Bristol Schoolboy League and an Under 14 team in the North West Avon Sunday league. The Thornbury Youth Club won the Avon County Youth Club Five-a-side championship and represented the County in 1977 in matches against other counties in the South West including Wiltshire, Somerset, and Dorset. In 1975-76 the Club won the Senior Berkeley Hospital cup. The Senior side in 1976-77 had an average age of 19 with Mike Ponting, skipper, the veteran at 24 and two 16-year-olds in Lee Curtis and Nick Walker were the youngest players. Keith Huxley played for the Bristol & Suburban League representative side. Every Easter for a number of years Cyril Lambert has taken one or two teams on a tour of the Continent arranged through the good offices of a friend who formerly played for Bruges. They make their centre at Ostend and have played matches in Belgium, Holland and France.